Race starts are the most important part of any race, because it determines how hard you will have to work to get into the top rankings. You should read the Sailing Rules page before reading this one as you may not understand some of the terms used. First lets discuss the dynamics of the line. Remember that port gives way to starboard? Its the same on the line. If you are on a port tack going along the line you will have to stay out of the way of starboard boats. This ends up creating a dynamic circular course that all boats end up following with starboard tack boats nearer the line and port tack boats further away from the line. Next you need to decide on, which side you want to start. To figure this out you need to know if there is a race start line bias. This means that if there is a bias, one part of the line will be more windward that another and will be more preferential to start on. This is because starting on the biased side of the line will give you an immediate advantage in terms of distance as you will be nearer to the next mark than they will be. To find out if you have a start bias, you will need to use a Tack Tick or a compass. Say you are on a starboard tack along the line and you do the above steps. If your point of sail is head to wind then there is no bias on the line. 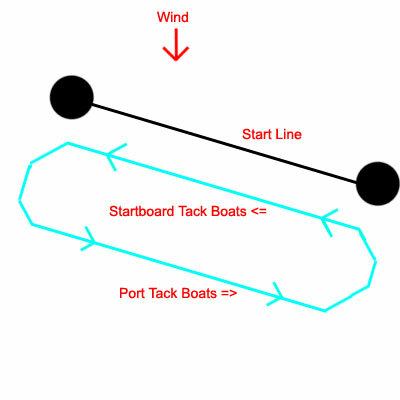 If your point of sail is a beat or close haul after you have tacked then there is a port bias. If your point of sail is a beat or close haul, without tacking then there is a starboard bias. 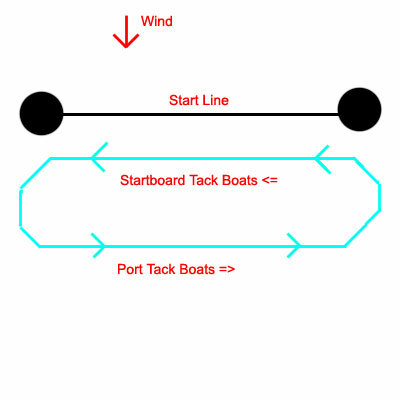 A port bias means that you should start port end to be further ahead of other boats and a starboard bias means that you should start starboard end to be further ahead of other boats. Remember though that port boats give way to starboard boats. The port bias needs to be large enough that you can sail uninterrupted by starboard boats. Also remember that everyone in the fleet will be looking for the bias so do it quickly and find your starting position early. Your starting position is determined by the number of boats, the size of the start line and the area surrounding the start line. For instance, if the port end is biased, but is close to the shore, boats will not want to start directly on the port buoy, but maybe two-thirds of the way down. Once you have decided on your tack, you need to figure out how far up or down you will be on the line. This will determine at what point you begin to move towards your starting position. Too early and you will have to go round and come back, potentially going to the back of the fleet. Too late and you will not be on the line, but in someone else's dirty wind and unable to point high. Of course if you are in someone's dirty air you can push them windward (using the windward rule). This will make them have to go higher potentially making them change their plans. At between 10-20 seconds till the start (depending on start line length and your starting position) you should be on the line and attempting to slow down and stick in your starting position. At 3-5 seconds till the start you should pull in your sails, start to point high and gain speed. At exactly on the horn you should be over the line and speeding away. Decisions made a few seconds after the start can cause you to win or lose. Finding a nice patch of wind with no-one else on it will guarantee you a good start. However if you are the windward boat with lots of boats to leeward of you pushing you higher and higher, you may consider tacking. Tacking onto port post starts has to be very quick, else you may crash into oncoming starboard boats. Try to duck starboard boats as they come at you and make sure you crew is watching through the genoa for oncoming starboard boats to give the helm quick warnings. After the start the boats will begin to space out and now the beating strategy takes place, where you implement your beating skills. If you can start implementing your beating skills before the boats have spaced out then you can overtake and climb higher up the ranks. As shown, race starts are a very important part of the race and may determine what place you come (yes, even that early). So practice your race starts and get into a routine with your crew or helm. Also ask veteran sailors how they do their race starts or maybe even crew for them and watch what position they will move into and remember under what conditions (number of sailboats, line length and surroundings of the line). This will fast track your learning to start executing perfect race starts.